Where's best for movies in a post-Blu-ray world? Many of us will still have shelves stacked with DVDs and Blu-rays, but physical media is making less and less sense in a world of superfast broadband and ubiquitous internet access. If you do want to buy your films digitally, where do you start looking? There are all kinds of considerations to weigh up, from the devices you're going to be able to play your films on to the quality of the movies you're getting. Here we run down the five leading online movie sellers and compare the features available from each. Apple's store was one of the first places you could buy movies in digital form, and it's still going strong - it remains one of the best options for actually keeping films permanently, even with the rise of the likes of Netflix. The selection of movies is a good one too, with many offering iTunes Extras as well (bonus content equivalent to DVD extras). Watching movies on iTunes works fine on Windows and Mac, but there's no support for Android devices, many streaming sticks or indeed the web if you're stuck with a browser and nothing else (Chromebook owners). Buying movies on iTunes makes most sense for those who are already heavily invested in Apple's hardware and software ecosystem. And if that's you then fine. Movies cost anywhere from £8 to £14 depending on their age and popularity, and you can save some pennies by opting for standard rather than high definition. Movies are downloaded to your devices rather than streamed, but you can delete and redownload them as many times as you want to save local storage space. As you would expect from Google, its Play Movies service lives mostly on the web and can be accessed from just about everywhere, and there are mobile apps for Android and iOS too. Unlike iTunes it will work with streaming sticks such as the Chromecast and the Roku, but both Apple and Google's movie offerings are shut out from the Amazon Fire TV. Based on a rather random sampling, Google Play's film line-up now looks almost as strong as the one on iTunes, something that hasn't always been the case. 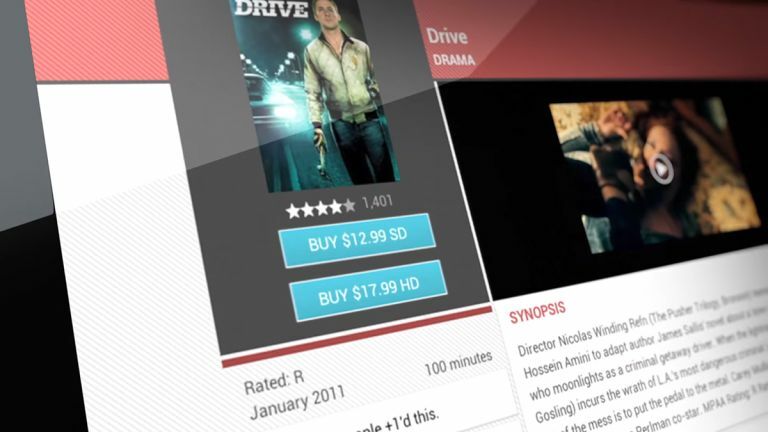 Prices are more uniform (usually £9.99 for HD) and movies are typically streamed rather than downloaded, though there is the option to cache movies ready for offline viewing on mobile devices. Google doesn't seem to have quite figured out how Play Movies and YouTube fit together yet, and you can access your purchased films through YouTube too. It doesn't quite have the polish of iTunes, but Google Play Movies is available in a few more places and is more of a web-friendly option if you don't want to be tied to a particular list of devices. Sky has been a major movie player in the UK for some time, and earlier this year it started giving customers the opportunity to buy films for keeps through their satellite boxes. If you're a subscriber you can then watch them on your box, on the web, or through the dedicated Android, iOS and Roku apps by signing in with your Sky Store credentials. It works as a standalone service too, so you can use it independently of a Sky subscription. Movies - with prices ranging from £8-14 - are typically streamed, though as with other services you can cache offline copies on your mobile devices for those times when you're without Wi-Fi. Sky will even send you a DVD copy of the film through the post. It's a decent enough service for new releases (although the availability of older films is rather patchy), and you're not tied to a subscription. As yet Virgin Media doesn't offer a comparable service through its cable boxes, though you can get movies streamed to your television on-demand, even if you can't purchase or keep them permanently. Microsoft has been scurrying around trying to knock its own music and movie offerings into shape to catch up with Apple and Google, but it hasn't quite got there yet - as you'll notice if you open up the Films & TV app in Windows 10. The interface is sparse, the prices are relatively high, and you can't get at the same selection from inside non-Microsoft browsers. That said, the Microsoft store does have most new releases and plenty of old classics too - it would seem at this stage in the digital movie game a lot of the major tech companies have signed the same deals with the movie studios. Older films come in at around the £10 mark while the going rate for a brand new release is £13.99 for the HD edition. Movies are streamed by default but can be saved in advance for offline viewing as long as you're using a Windows 8/10 computer, mobile device or games console. It's a perfectly passable option if you're a heavy user of Microsoft's software and hardware, but at the moment it's not really going to tempt in anyone who doesn't fit that description. Amazon Instant Video (sometimes called Amazon Prime Video) offers both a Netflix-style subscription service and the ability to purchase movies permanently. If you're a Prime subscriber (£79 per year or £5.99 per month just for video) you get some of the lower-tier movies for free; you can then rent or buy other films through the service as well. As far as choice, there's just about everything you could want. We looked for the most recent releases as well as some old classics of cinema and found just about everything we wanted - Amazon seemed to have some older films in HD that were only available in SD elsewhere as well. It doesn't have every film ever made, but the selection is impressive. Prices vary from around £8 for older HD films to £13.99 for the latest HD releases (£13.99 seems to be the top price bracket across most of these platforms). Of course the service works well with Amazon's Fire TV kit, but it's also compatible with Android, iOS, Roku devices and various consoles and smart TVs, with offline syncing available as well. Away from the big names in tech, there are several other choices. If you're happy with renting rather than owning, Netflix gives you as many films as you can handle for the same flat monthly subscription fee, but of course it may not always have the movies you want to see - and the choice of movies changes every month as licensing deals expire and get renewed. With Blinkbox, you pay by the film - so you can splurge as little or as much as you want each month. Previously run by Tesco and now owned by TalkTalk, the service has a lot of the latest releases (usually before they appear on DVD) and you can pick up HD digital copies to keep forever for £6 and above. Consoles, computers and mobile devices are supported. And that's just in the UK - if you're prepared to use a VPN or similar service to access international services then there are many more options to choose from. Ultimately your choice of service comes down to which devices you primarily want to watch your movies on, and which ecosystem you've already invested the most on (Apple, Google or another). Now you've got the movies sorted, check out the best streaming music services.